It's been a long day and an even longer night in Athens, Brussels and here in London. We're bringing our live coverage to a close now. But you can keep up to date with all the latest developments here . News agency AFP quotes Eurogroup chief Jeroen Dijsselbloem as saying: "We have had an in-depth discussion of the Greek proposals, the issue of credibility and trust was discussed and also of course financial issues involved, but we haven't concluded our discussions. "It is still very difficult but work is still in progress." Joseph Muscat, Prime Minister of Malta. Eurogroup President Jeroen Dijsselbloem has told journalists that the talks were "difficult", but work was still in progress. News just in: Sources confirm that the Eurogroup meeting of finance ministers has closed for the day and will start again tomorrow. This was never going to be easy. Finance ministers are drawing up a list of extra demands for Greece to approve as evidence that they actually mean business. Finland has said that its government is not willing to support a bailout of Greece. The Italians on the other had have said they will come in tomorrow and demand that a deal is done for the sake of European unity. As the talks continue, the Greek rumour mill has gone into overdrive. But economist Tom Nuttall - along with an impish Bart Simpson - offered this warning. Who are the Finns Party? A general election in Finland earlier this year saw the Finns Party enter a coalition government - with its leader Timo Soini appointed foreign minister. Its eurosceptic stance is likely to have played in a part in Finland's reported rejection of Greece's latest bailout proposal. Mr Soini previously described its bailout policy as "a moral hazard". Professor of politics at Helsinki University, Jan Sundberg, took a closer look at the party following its successful election performance. You can read his thoughts here . So it appears Finland really is saying no. Business newspaper Kauppalehti reports (in Finnish) that the country's government does not intend to vote in favour of a new emergency loan program for Greece. The decision may be down to the position of Finland's foreign minister Timo Soini, who is also the leader of the eurosceptic, Finns Party. Kauppalehti cites sources that claim Mr Soini is not prepared to accept the debt deal with Greece on any terms. He was previously quoted as saying that the Greek bailout policy was "a moral hazard and a pyramid scheme that will continue as long as the milkmaid has a cash cow to milk". AP news agency has just reported that there are few signs the Greek bailout discussions between the country's finance minister and his counterparts in the 19-country eurozone are going to wrap up any time soon. The finance ministers have been meeting since mid-afternoon to assess whether Greece's reform proposals are sufficient to merit another bailout package. European diplomats reportedly told AP the meeting could run late, even until the early hours of Sunday. This tweet from Finish journalist Jarno Hartikainen suggests Finland has refused to accept the new bailout proposals. So if Finland does put its foot down - what does that mean for Greece's chances of securing the money it needs from the European Stability Mechanism? Although the support of all eurozone nations is preferable, the ESM can turn to an "emergency" clause which states a deal can be passed if 85% of remaining members states agree. This graph below tweeted by Professor of Economics Karl Whelan helps explain what kind of power Finland holds compared to other nations. Greek banks have been closed for some time now and strict capital controls put in place. But massive deposit withdrawals prior to the enforced bank holiday have left institutions very short on cash. Reuters news agency reports that eurozone ministers have been told that up to €25bn of any bailout loan would be needed to recapitalise banks that are on the verge of collapse. That is more than double the amount that Athens forfeited in financial stability funds at the end of June when it walked away from talks on completing a previous bailout programme. European Union leaders are preparing for a final decision on Greece's future at a summit on Sunday. So what are the possible scenarios, asks the BBC's Paul Kirby. As Greece's economy has declined, drug use and prostitution has become a common sight around Omonia Square in downtown Athens, writes the BBC's Jasmine Coleman. It is not where you would expect to find the main offices of a country's ruling political party. But left-wing Syriza still has its headquarters nearby, in a show of solidarity with the poor and the vulnerable that it pledged to protect when it came to power. Read more from Jasmine here. What is the European Stability Mechanism, or ESM, which Greece is seeking financial support from? Our handy explainer here will tell you all you need to know. The "timeout" from the eurozone "would be accompanied by support [for] Greece as an EU member and the Greek people with growth-enhancing, humanitarian and technical assistance over the [coming] years", the document reportedly says. The Wall Street Journal adds that the purpose of the document is not clear - "whether it is a warning shot or a real proposal from the biggest eurozone economy". According to the Wall Street Journal: "In the document, dated 10 July, Germany takes a tough line on spending cuts and policy overhauls Greece submitted to its international creditors, the other eurozone countries and the International Monetary Fund, late Thursday." It quotes from the document: "These proposals cannot build the basis for a completely new, three-year ESM [European Stability Mechanism] program, as requested by Greece. We need a better, a sustainable solution." Wall Street Journal says it has seen a document prepared by the German finance ministry which proposes a five-year Greek exit from the eurozone as one of two possible options. According to the newspaper, it was sent by Germany Finance Secretary Thomas Steffen to counterparts from other eurozone countries - but has not been discussed at the Brussels meeting. What happened to the 'No' vote? Less than a week after they triumphantly gave international creditors a bloody nose by rejecting a harsh austerity plan, angry and bewildered Greeks are left wondering how they now find themselves swallowing an even worse deal, writes The Daily Telegraph's Nick Squires. So whatever happened to the referendum result, he asks? Watch the BBC interview with Greek Economy Minister Giorgos Stathakis here - he tells Gavin Hewitt that a deal will be reached this weekend, with trust rebuilt "step by step". He also says Greece's latest proposals in negotiating with creditors have been accepted by eurozone finance ministers. A chess board on display in an Athens shop - many Greeks feel it is particularly apt today, with what they see as tactical moves being made miles away in Brussels. Perhaps unsurprisingly, the BBC's Jenny Hill, in Brussels, says the talks are said to be going "extremely slowly" - and that they are expected to continue long into the evening. Sources have told our correspondent there is a "50/50 chance" of a deal being struck. However, Germany was said to be "putting up fierce resistance at the negotiating table". According to Reuters, Giorgos Stathakis says banking restrictions will remain in place "for some time". They include a limit of €60 a day which Greeks can withdraw from cash machines. Quote Message: [German] officials may well have been exploring numerous different options. These could simply have been leaked in order to put more pressure on Greece during the negotiations. [German] officials may well have been exploring numerous different options. These could simply have been leaked in order to put more pressure on Greece during the negotiations. Quote Message: It's hard to see the benefits of casting Greece into a limbo where it would apparently be neither a full member of the euro, nor committed to producing its own currency and rebuilding its economy outside the single currency zone. It's hard to see the benefits of casting Greece into a limbo where it would apparently be neither a full member of the euro, nor committed to producing its own currency and rebuilding its economy outside the single currency zone. Quote Message: However there seems little doubt that, even if this weekend's talks prove fruitful, future negotiations between Greece and its creditors are likely to be fraught. However there seems little doubt that, even if this weekend's talks prove fruitful, future negotiations between Greece and its creditors are likely to be fraught. Quote Message: Yes, Athens has already agreed to most of their demands - despite the resounding 'No' vote in last Sunday's referendum. But the process has moved on. It's no longer about releasing a mere 7.5 billion euros from an existing funding programme. Greece is now requesting a new three-year bailout, worth 53.5 billion euros. For that kind of money, it is likely to face demands for yet more painful reforms. Yes, Athens has already agreed to most of their demands - despite the resounding 'No' vote in last Sunday's referendum. But the process has moved on. It's no longer about releasing a mere 7.5 billion euros from an existing funding programme. Greece is now requesting a new three-year bailout, worth 53.5 billion euros. For that kind of money, it is likely to face demands for yet more painful reforms. Quote Message: The Frankfurter Allgemeine Zeitung says it has seen a German position paper which sets out two possible options for Greece - firstly, it could transfer assets worth 50bn euros into a special fund; they could then be sold and the revenue used to pay off its creditors. The Frankfurter Allgemeine Zeitung says it has seen a German position paper which sets out two possible options for Greece - firstly, it could transfer assets worth 50bn euros into a special fund; they could then be sold and the revenue used to pay off its creditors. Quote Message: Secondly, it could take a five-year 'time out' from being a member of the euro, in order to restructure its debts. Secondly, it could take a five-year 'time out' from being a member of the euro, in order to restructure its debts. Quote Message: A note of caution: although this paper appears to come from within the finance ministry, it does not necessarily reflect Germany's actual position in the talks. Indeed, there are some indications that it doesn't. A note of caution: although this paper appears to come from within the finance ministry, it does not necessarily reflect Germany's actual position in the talks. Indeed, there are some indications that it doesn't. Greece's Economy Minister Giorgos Stathakis says the [Greek] proposals have clear terms and the primary surpluses have been agreed, Reuters news agency is reporting. Greek newspaper Tovima reports (in Greek) that there has been a pause in proceedings to allow Greek Prime Minister Alexis Tsipras, who is in Athens, and Finance Minister Euclid Tsakalotos, in Brussels, to discuss matters over the phone. And here's a different view of things. Stathis Kalyvas, professor of political science at Yale University, tells the BBC's Tim Willcox he is feeling very positive. He says it is the first time there is the political will to change things and that he thinks Alexis Tsipras is the person who can lead that change. 'No' voter Vasilis Papadopoulos, 24, says he wants to leave Greece because he doesn't see a future in the country. Instead, he has applied to study in the UK. "Nothing is changing here", he says. Watch our interview with him here. More pictures have come in from inside the Lex building, where the meeting is taking place. Here (above) is Dutch Finance Minister Jeroen Dijsselbloem - who is chairman of the eurogroup - on the right, speaking with EU economy commissioner Pierre Moscovici, far left, and Finland's Finance Minister Alexander Stubb, centre. Here's a friendly welcome being given to Greek Finance Minister Euclid Tsakalotos (right) by Spain's Economy Minister Luis de Guindos. Penny for your thoughts? 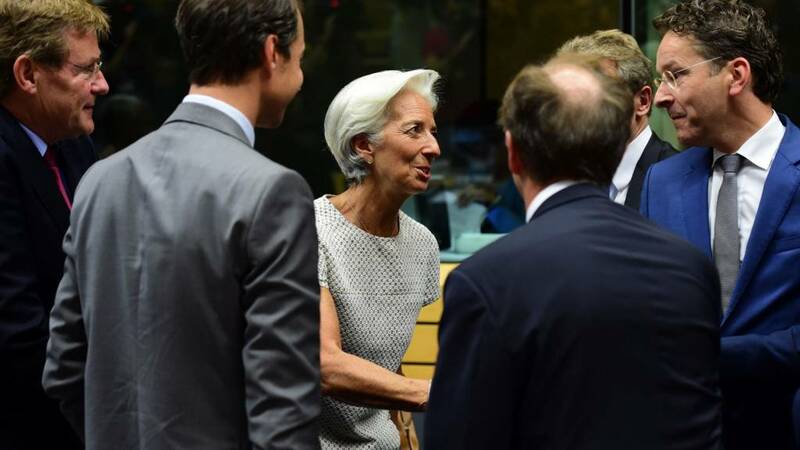 IMF chief Christine Lagarde pictured before proceedings got under way. reports (in German) that the German finance ministry does not believe the Greek proposals go far enough, and suggests two options. Under the first, Athens would improve its proposals quickly and transfer €50bn in assets to a fund to pay down its debts. The alternative would see Greece taking time out from the eurozone to restructure its debts while remaining part of the EU. Where there is a crisis, there is also an opportunity - as demonstrated by this Bitcoin ATM recently installed in Athens. While Greeks are limited in how many euros they can withdraw, there are no such limits in exchanges of the virtual currency. Fortune explains more . Quote Message: In the third round of austerity measures, which is beginning now, it is certain that in Greece there will be no consumers, there will be only beggars. In the third round of austerity measures, which is beginning now, it is certain that in Greece there will be no consumers, there will be only beggars. All sides say they want Greece to remain in the euro, but if it were to leave, The Economist has some suggestions as to how to handle the move. Quote Message: One task is to clarify the legal uncertainties. (Is Greece permanently out of the euro or just temporarily issuing IOUs? Can it remain in the EU if it is not in the euro?) The second is to ensure that an exiting Greece has both the policies to stabilise its economy and avoid high inflation and the cash to pay for critical imports. One task is to clarify the legal uncertainties. (Is Greece permanently out of the euro or just temporarily issuing IOUs? Can it remain in the EU if it is not in the euro?) The second is to ensure that an exiting Greece has both the policies to stabilise its economy and avoid high inflation and the cash to pay for critical imports. Former Greek Finance Minister Yanis Varoufakis once quipped that the euro was like the Hotel California of the Eagles' famous song: "You can check out any time you like, but you can never leave." Journalist Elodie Lamer in Brussels continues the joke. Quote Message: We are now truly at the endgame. Greece’s banks have closed, its debt has been acknowledged as unsustainable, and yet the future of both the banks and the debt remains uncertain. The decisions taken by Europe in the next several days will determine Greece’s fate; wittingly or not, they will determine the EU’s fate as well. We are now truly at the endgame. Greece’s banks have closed, its debt has been acknowledged as unsustainable, and yet the future of both the banks and the debt remains uncertain. The decisions taken by Europe in the next several days will determine Greece’s fate; wittingly or not, they will determine the EU’s fate as well. Why should I care about Greece? After months of talks, it is easy to lose sight of why the Greek crisis is important. Here are five reasons why it matters. Sophia Zachariadi voted for Syriza in the election and 'No' in the referendum on creditors reform plans for Greece. Quote Message: How can a left-wing party decide this and take austerity measures? I don't think that this society can stand another three years of austerity measures, not only economically but psychologically. I feel betrayed because I know what I wanted. How can a left-wing party decide this and take austerity measures? I don't think that this society can stand another three years of austerity measures, not only economically but psychologically. I feel betrayed because I know what I wanted. The rise of Syriza in Greece has bolstered the hopes of far-left groups in Europe, namely the Podemos party in Spain. But Spanish Prime Minister Mariano Rajoy has used the Greek crisis to take a swipe at his left-wing opponents ahead of an impending general election. As he gears up for one of toughest campaigns in decades, Mr Rajoy said: "One doesn't have to go very far to see how easy it can be to ruin a recovery. "Is that the change offered by the new far left parties in Spain?" He continued: "What's happening (in Greece) today? They're back in recession. "Hopefully this weekend the Greek government will finally reach an agreement with European institutions... (but) it won't repair the damage that was caused." What exactly is happening in Greece and why has the country found itself in the current crisis? Here are the key numbers you need to understand what's going on. Here is Greek Finance Minister Euclid Tsakalotos and an apparently untouched plate of biscuits at the eurozone talks. His German counterpart has warned of "extraordinarily difficult" talks ahead, so he may want to keep his strength up. I think we are here to make a lot more progress. Our problem is that a situation has developed, where trust and hope created in the last years was destroyed in a very short time. We've seen a referendum in which a clear majority voted against conditionality. Now we see the exact opposite of that. There is still a lot of criticism on the proposal, reform side, fiscal side, and there is of course a major issue of trust. Can the Greek government be trusted to do what they are promising? I expect a long finance ministers' meeting on Greece. It is not very easy but we will do all we can. I think the trust is now being rebuilt in the relationship with Greece. I would hope that trust would continue to be rebuilt today. France has always said there is no taboo about the debt. We have the right to talk about the debt. The site also mentions speculation in the Greek media that early elections could be called. Greeks can only withdraw €60 a day from ATMs, but in practice many have only been able to get €50 due to a shortage of €20 notes. With this in mind, an app to help Greeks find ATMs dispensing the right notes has been developed. There are plenty of serious faces in Brussels today, but in Athens many people are turning to humour to get themselves through the crisis. Here's a selection of jokes doing the rounds online - and on the streets. Q: "What is the capital of Greece?" Q: "What's a Grecian urn?" A: "A lot less than he did two years ago." Q: Nice tan. Did you spend the weekend at Psarou beach (a VIP spot on Mykonos island)?" A: No. I got it from waiting in line for the cash machine." Politicians have been trading jokes too. At an event in Frankfurt on Thursday, German Finance Minister Wolfgang Schaeuble, reportedly joked with his US counterpart Jack Lew that the two should swap their respective debt problems: Greece for Puerto Rico. I offered my friend Jack Lew... we could take Puerto Rico into the eurozone if the US were willing to take Greece into the dollar union." Of all of its creditors, Greece owes Germany the most - €68bn (£49bn; $75bn) - writes BBC Berlin correspondent Jenny Hill. So the German opinion matters. Quote Message: If and when Greece puts a bailout deal on the negotiating table, German MPs will vote - first on whether they are prepared to let negotiations go ahead and then, later, to approve any deal. A 'no' from Germany could railroad any third bailout for Greece. If and when Greece puts a bailout deal on the negotiating table, German MPs will vote - first on whether they are prepared to let negotiations go ahead and then, later, to approve any deal. A 'no' from Germany could railroad any third bailout for Greece. Wolfgang Schaeuble - Germany's Finance Minister - is the latest high-profile negotiator to arrive for the meeting. He said he expected an "extraordinarily difficult" discussion and ruled out that elusive debt haircut. "Our problem is that a situation has developed, where trust and hope created in the last years was destroyed in a very short time," he said. "We've seen a referendum in which a clear majority voted against conditionality. Now we see the exact opposite of that. "So most certainly we can't rely on promises. We will want to see a programme that's implemented step by step." More from Austrian Finance Minister Hans Joerg Schelling. He told Austrian radio station ORF that he believes there's a 60/40 chance of a deal. "If the guarantees don't come, this will reverse." BBC Berlin correspondent Jenny Hill says some ministers from smaller countries - including Lithuania, Slovakia and Latvia - are facing "fierce opposition" domestically to any kind of third bailout agreement. Quote Message: "That said, the feeling here is that as long as Germany says yes, those countries will fall into line." "That said, the feeling here is that as long as Germany says yes, those countries will fall into line." Greece's exit from the eurozone - a "Grexit" - has become a genuine possibility, as European Union leaders prepare for a final decision at a summit on Sunday, writes the BBC's Paul Kirby. What are the different possible scenarios? Read morehere. Dutch Finance Minister and Eurogroup chairman Jeroen Dijsselbloem has just arrived in Brussels. He says the next few hours of discussion will be "complicated". "Even if it's all good on paper the question is whether it will get off the ground and will it happen," he added. He was asked if there would be talk of debt relief. "I don't know we will get to that. There is still a lot of criticism on the proposal, reform side, fiscal side, and there is of course a major issue of trust. Can the Greek government be trusted to do what they are promising, to actually implement in coming weeks, months and years?" Why was the referendum held? Just over a week ago, Alexis Tsipras stepped on to a podium in Syntagma Square in Athens, writes the BBC's Mark Lowen. In his trademark open-necked white shirt, his sleeves rolled up, he punched the air. "I call on you to say a big 'no' to ultimatums, 'no' to blackmail," he cried. "Turn your back on those who would terrorise you." His thousands of fans roared in approval. The Greek public followed his lead and 61% voted "oxi" ("No"). Roll forward seven days and Greece's prime minister signed the very measures he had fought against. Corporate tax and VAT will rise, privatisations will be pursued, public sector pay lowered and early retirement phased out. Here's some more from EU economy commissioner, Pierre Moscovici. Quote Message: I note that the Greek government has made significant gestures, has sent a request for a [bailout] programme. The Greek parliament voted yesterday massively in favour of a list of reforms, which is a sign of commitment towards Europe. The three institutions played their role, the European Commission, the International Monetary Fund, the European Central Bank. Together, we have said the Greek reform programme could constitute a basis for a new programme from the European Stability Mechanism. I note that the Greek government has made significant gestures, has sent a request for a [bailout] programme. The Greek parliament voted yesterday massively in favour of a list of reforms, which is a sign of commitment towards Europe. The three institutions played their role, the European Commission, the International Monetary Fund, the European Central Bank. Together, we have said the Greek reform programme could constitute a basis for a new programme from the European Stability Mechanism. Austria's Finance Minister Hans Joerg Schelling has said the cost of a third Greek bailout would be €72bn (£51bn). Ahead of the crunch meeting in Brussels, Mr Schelling voiced concern about convincing his colleagues back home to vote for the deal unless strict conditions were met. He said the bailout was "a lot of money for a three-year programme". "After that Greece would have to be in a position to get fresh capital. If we can't reach that security I'm not sure I can get the Austrian parliament to vote for the proposals," he added. The BBC's Jasmine Coleman has tweetedsome of the graffiti she has seen while reporting in Athens. Here's Alexis Tsipras arriving at his office in Athens earlier today as the talks that could decide Greece's future in the euro get underway in Brussels. Eleni Panagiotarea, author of Greece and the Euro, told Tim Willcox on BBC World News that Alexis Tsipras may have lost some of the support of his own party - but he seems to have gained a national consensus in parliament. That parliamentary consensus should help him take ownership of reform implementation, she says, something which was lacking in previous governments in Greece. The Netherlands and Austria have both backed Germany's tough approach to Greece. As these tweets from euro-watchers suggest, they are not likely to let Greece off the hook easily. You can read more about where different eurozone countries stand here. Is the truth out there...? So, will a deal be reached this weekend, asks the BBC Europe editor Katya Adler. Read more on Katya's blog. our guide to some of the terms used in the Greek debt crisis useful. Quote Message: A huge lack of trust has developed over the past few months - and there are grave doubts in many countries about whether Greece will ever implement many of these reforms even if they are agreed on paper. There's also concern about the level of funding it looks like Greece will need over the next three years in order to stay afloat. So there is plenty for finance ministers to discuss and it could be a long night. One senior EU official said the chances of an agreement were roughly 50-50. A huge lack of trust has developed over the past few months - and there are grave doubts in many countries about whether Greece will ever implement many of these reforms even if they are agreed on paper. There's also concern about the level of funding it looks like Greece will need over the next three years in order to stay afloat. So there is plenty for finance ministers to discuss and it could be a long night. One senior EU official said the chances of an agreement were roughly 50-50. Technical experts from the EU and the IMF have recommended that Greece's latest proposals for economic reforms and budget cuts can be a basis for negotiating a new international bailout, writes BBC Europe correspondent Chris Morris. Quote Message: That's an important step, and if approved it should be enough to prevent Greece sliding into bankruptcy next week. But eurozone finance ministers will also want to have their say, and opinion is divided. Some countries are optimistic: they believe Greece has at the eleventh hour come up with a serious and credible plan. Others are much less certain. That's an important step, and if approved it should be enough to prevent Greece sliding into bankruptcy next week. But eurozone finance ministers will also want to have their say, and opinion is divided. Some countries are optimistic: they believe Greece has at the eleventh hour come up with a serious and credible plan. Others are much less certain. Arriving in Brussels for the crucial talks, IMF head Christine Lagarde said: "I think we are here to make a lot more progress." With cash withdrawals limited to 60 euros a day it has been a worrying couple of weeks for some Greek families. One of them is the Katsaounos family from Patras in western Greece. BBC journalist Howard Johnson spent the day with them to find out how they were coping on a limited household budget. You can watch his report here. The eurozone finance ministers are due to discuss the Greek plans from 13:00 GMT in Brussels. The new Greek Finance Minister Euclid Tsakalotos, got there more than two hours early - as did his French and German counterparts. The pressures on Greece over the next few days are pretty obvious, writes the BBC's Europe correspondent Chris Morris. Failure to strike a deal would leave both the Greek state and the Greek banking system staring bankruptcy in the face. Money would run out, and imported goods would soon disappear. And while the rest of the EU would offer humanitarian support, it would be extremely painful for all concerned. But there are also pressures on the rest of the eurozone - less immediate perhaps, less obvious in some ways, but equally significant. Read more here. There are many reasons why Greece finds itself in a precarious financial position, one of which is its poor record at collecting tax. But is it really true that in 2010 the government collected only 10% of the tax it was due? If Greece does not reach agreement with its creditors, it may have to create a new currency. The BBC considers how easy that might be. Greece's former finance minister, Yanis Varoufakis, was not there for the vote in Greece's parliament - perhaps he was putting the finishing touches tothis strident editorial. In it, he describes Greece's 2010 bailout secured in the wake of the financial crisis as "sordid", a way of protecting French and German banks at the expense of ordinary Greeks. How have others coped with being bailed out? While Greece is in the news now because it desperately needs another bailout it is not the only country in the eurozone that has had to be rescued. Ireland, Portugal, Spain and Cyprus have all been in the same boat. The Greek Prime Minister, Alexis Tsipras, has reasons to be cheerful. His proposals to Greece's creditors easily passed overnight in parliament, backed by 251 out of 300 deputies. But among those dissenting were members of his own Syriza party. The speaker of parliament, Zoe Konstantopoulou, said Mr Tsipras had been "blackmailed". ... and welcome to our live page, bringing you the latest as eurozone finance ministers consider fresh proposals from Greece aimed at securing a vital third bailout. No deal, and Greece risks crashing out of the single currency. Could a resolution finally be on the way to what EU President Donald Tusk calls the "most critical moment in the history of the eurozone"?